Michel Miguel Elias Temer Lulia (Portuguese pronunciation: [miˈʃɛw miˈɡɛw eˈɫij.jɐʃ ˈtẽmeɾ luˈɫij.jɐ], born September 23, 1940), better known as Michel Temer, was the President of Brazil and Brazilian lawyer from 2016 to 2019. He was the Vice President of Brazil from 1 January 2011 to 31 August 2016. He took office after become the running mate of Workers' Party candidate Dilma Rousseff in the 2010 election. 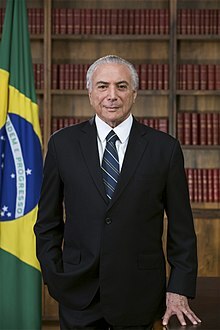 On 12 May 2016, he assumed the presidential powers and duties as Acting President of Brazil following the suspension of President Rousseff during her impeachment trial. He became President on 31 August 2016 after Rousseff was impeached by the Senate and removed from office. This page was last changed on 2 January 2019, at 05:59.